House at the End of the Street Movie It's Not Haunted. It's Not Cursed. It's Worse. 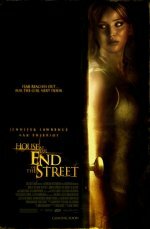 House at the End of the Street release date was Friday, September 21, 2012. This was a Nationwide in theaters release. Seeking a fresh start, newly divorced Sarah (Elisabeth Shue) and her daughter Elissa (Jennifer Lawrence) find the house of their dreams in a small, upscale, rural town. But when startling and unexplainable events begin to happen, Sarah and Elissa learn the town is in the shadows of a chilling secret. Years earlier, in the house next door, a daughter killed her parents in their beds, and disappeared - leaving only a brother, Ryan (Max Thieriot), as the sole survivor. Against Sarah's wishes, Elissa begins a relationship with the reclusive Ryan - and the closer they get, the deeper they're all pulled into a mystery more dangerous than they ever imagined. Based on a treatment and story written by Jonathan Demme and Jonathan Mostow.